Dumbbells don't take up very much room, they are easy to move to different locations, they can be used for a lot of different exercises, and you can easily change the weight. They are very versatile, but often underused. 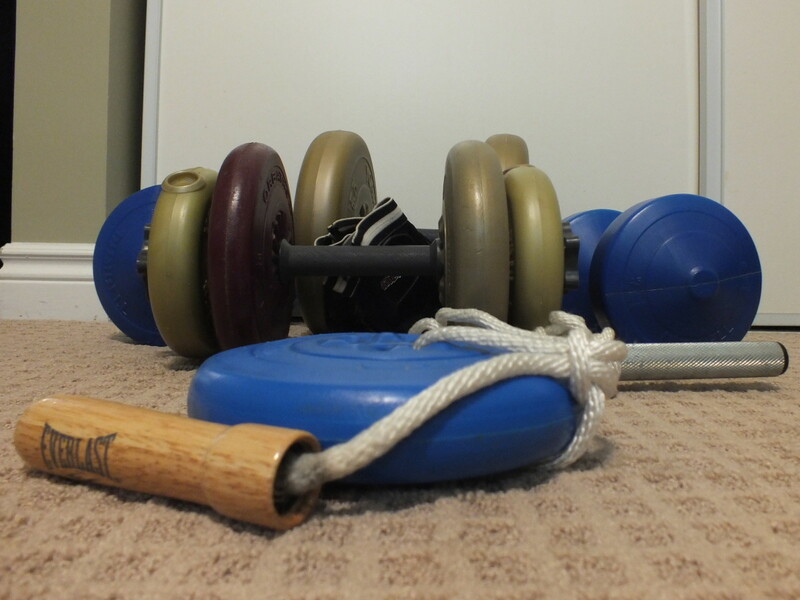 It may not occur to you that you can use them to work out more than your biceps. In fact, you can use them to work out out most of the muscles in your upper, middle and lower body. While the different dumbbell exercise listed below focus on one or two muscles, there are other muscles that help with the exercise. For instance, if you are standing you are going to be engaging your abs, back, and legs, so there is going to be some overlap. For most dumbbell exercises I recommend sets of 6 to 12 reps. If you can do more than 12 reps at a time, it would be a good idea to increase the weight. This list of exercises is based upon my experience. These exercises are done while standing straight with your feet shoulder width apart. Grab a dumbbell or two and get into position, letting your arms hang down at your sides. Extend your arms with the elbows slightly bent throughout the exercise. 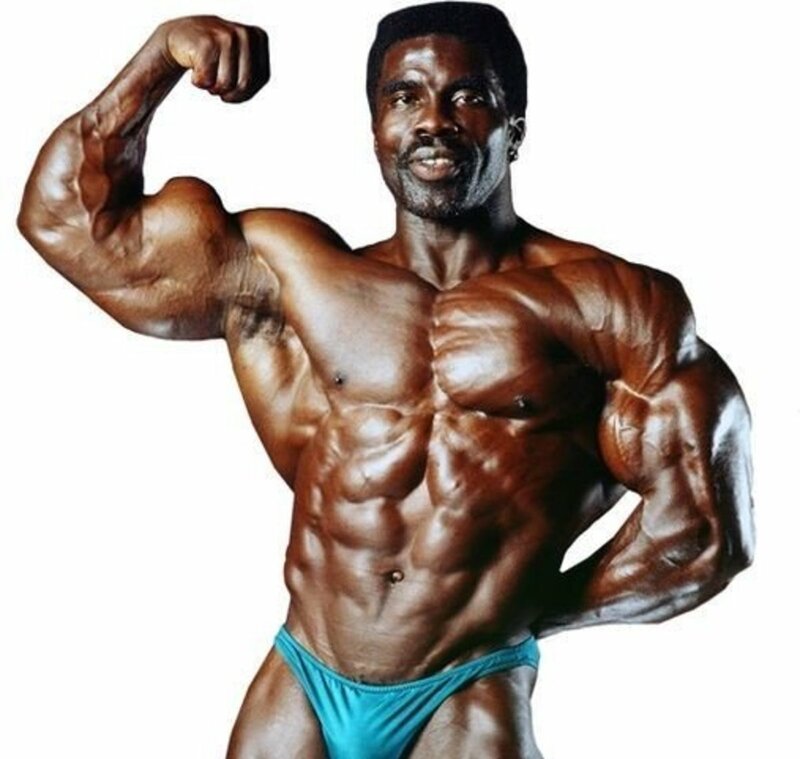 To do a front raise, lift your arms in front of you until your hands and elbows are at shoulder level. 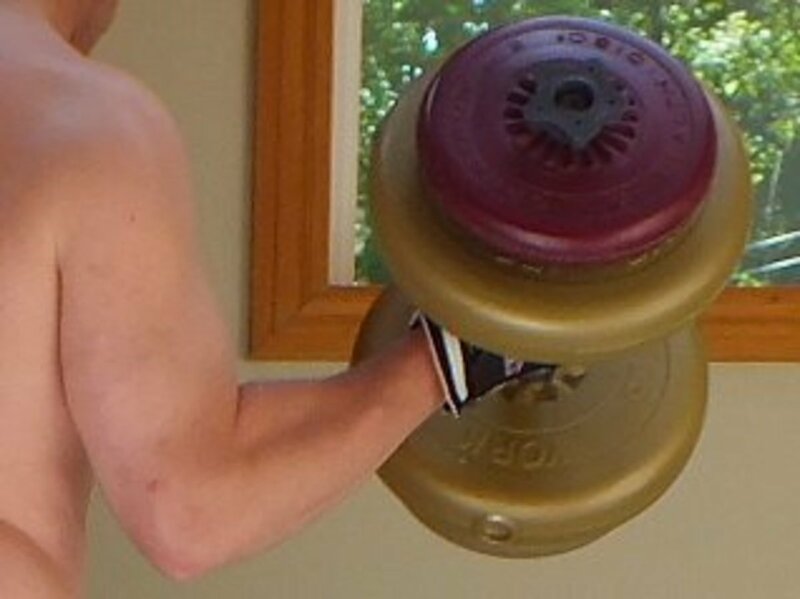 Use an underhand grip, but rotate the dumbbells slightly as you lift and go back to the underhand grip as you lower. For side raises (also know as shoulder flys) hold your palms face-in and you raise your arms out to the side. It is important that you use proper form. Keep the rest of your body still and don't cheat. The lifting and lowering should be slow and controlled. If you have trouble maintaining proper form, use lighter weights. Lifting one dumbbell at a time can make it easier to keep your body steady. You may want to use one arm to brace yourself. Dumbbell curls are the best dumbbell exercise for your biceps. They are very simple and very effective. Grab a dumbbell with an underhand grip and let it hang at your side. Part of the dumbbell should touch your leg. While keeping the shoulder and upper arm still, curl the forearm, bringing your hand towards your shoulder. Extend your forearm to get back into the starting position. Your biceps flex become bigger while raising the dumbbell and smaller when you lower it. For best results, make sure you lower the weight in a slow, controlled motion. The tricep muscles are worked with a pushing motion. Push-ups work the triceps and so do dumbbell kick backs. Place a dumbbell beside you. Get on your knees, bend over, and place your hands on the floor like you are going to do push ups. Grab the dumbbell and raise your elbow up and back so the weight is at your side and your elbow is close to your body slightly higher than your back. The upper arm should be horizontal and the forearm vertical, forming a 90% angle. Slowly extend your arm, hold for a second, then reverse the movement to get back into the starting position for one rep. Only the forearm with the weight should move. Don't move the upper arm. 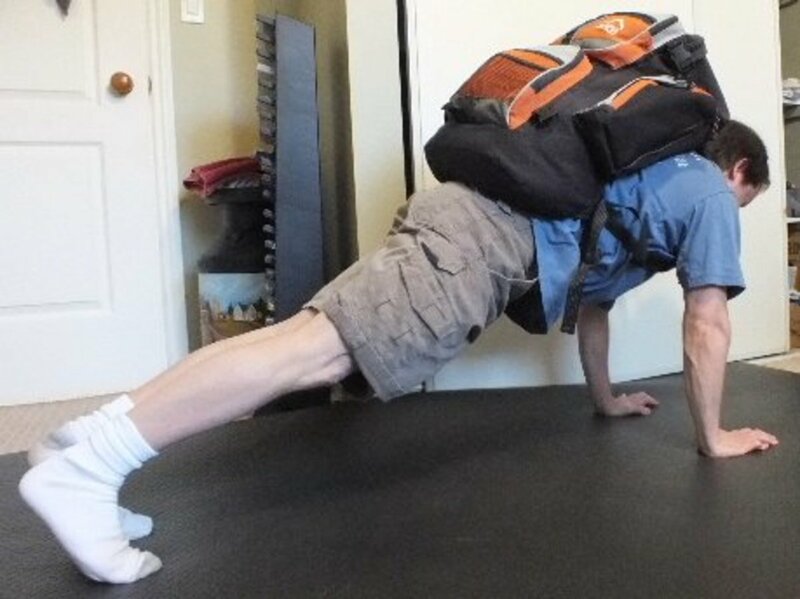 Use a fairly light weight for this exercise. Kick backs can also be done with your forearm on the floor instead of your hand. It changes the angle and can give your a better workout. Use both methods. If you have a bench or table that can hold your weight you could kneel on it with one knee instead of getting on the floor. A hard surface can hurt your knees so I use an exercise mat. 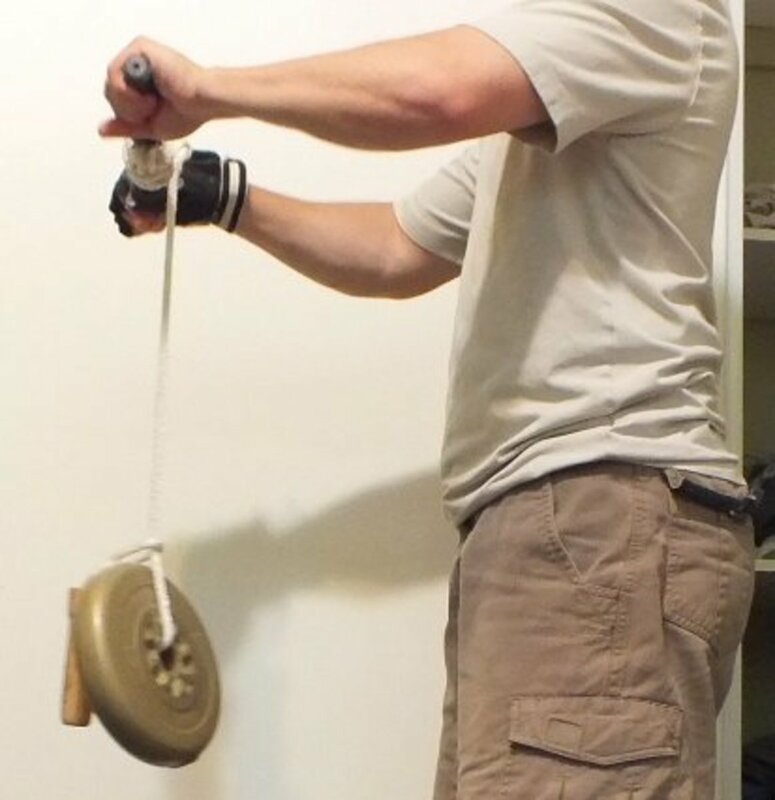 If you take your dumbbell apart and add some rope, you can use it to do wrist rolls. You tie one end of the rope to the dumbbell bar and the other end to a weight. Wrap some of the rope around the bar. To start the exercise, hold the bar out in front of you and rotate the bar with your wrists. Rotate it one way to raise the weight to the bar and the other way to lower it. Switch to the other side of the bar by switching the raising and lowering motion. For the two-arm, bent-over dumbbell row, pickup two dumbbells and stand with your knees slightly bent. Let your arms hang down in front of you. Bend over so your back is almost parallel to the floor. Raise your elbow until the dumbbells are at the your side. Hold briefly. Lower your elbows to get back into the starting position to finish one rep.
To do the one-arm, bent-over dumbbell row, modify the exercise by kneeling on a bench with one knee and supporting your weight with the arm on the same side. You could also use a table. The floor press is almost the same exercise as the bench press, except you are on the floor so the range of motion is limited and you don't use your leg muscles. Since you are on the floor it is not practical to use a barbell. Lay down on the floor facing up. Grab two dumbbells and place them over your chest. Do the exercise by slowly pushing the dumbbells up and lowering them back down. The motion should be slow and controlled. Each time you lower the weights, pause for a second before lifting the weights again. At its high point, wait briefly before lowering the weight. When you are done, place the dumbbells at your side. Lift two dumbbells at the same time or do one arm at a time. You can give your abs a great workout doing ab rollouts. Get on your knees and grab onto a pair of dumbbells. The dumbbells stay on the floor for this exercise. Roll the dumbbells forward so you are stretched out. Then roll the dumbbells back to your knees. Continue until you have finished your set. You should feel your abs working during both parts of the exercise. To use one dumbbell, place one hand on the dumbbell and the second hand on the first. This exercise can also be done with your knees off the ground. It works your abs more but it is much more difficult. I prefer to use one dumbbell for this exercise because it works my abs more. If you do as many reps as you can, you may be in a lot of pain later. Take it easy the first few times you do it and pay attention to how sore you are the next day. I did a lot because it did not seem very hard, then I was really sore the next day and I was still sore the day after that and the day after that. Obliques are your side abs. Sit on the floor with your legs out in front of you and put you hand on the floor. Bend your knees until your feet are flat on the floor. Lean back so your back is at 45% angle. That is halfway to the floor. You should feel your abs working. Without moving your thighs lift your feet off the floor until your lower legs are parallel to it. Grab a dumbbell or a weight plate. Then bring your hands up to your chest. To do one repetition slowly bring your hands to one side touching the floor with the weight by twisting your torso. Slowly twist back to the starting position. Try to keep your body steady. Focus on maintaining good form. It can take some practice. 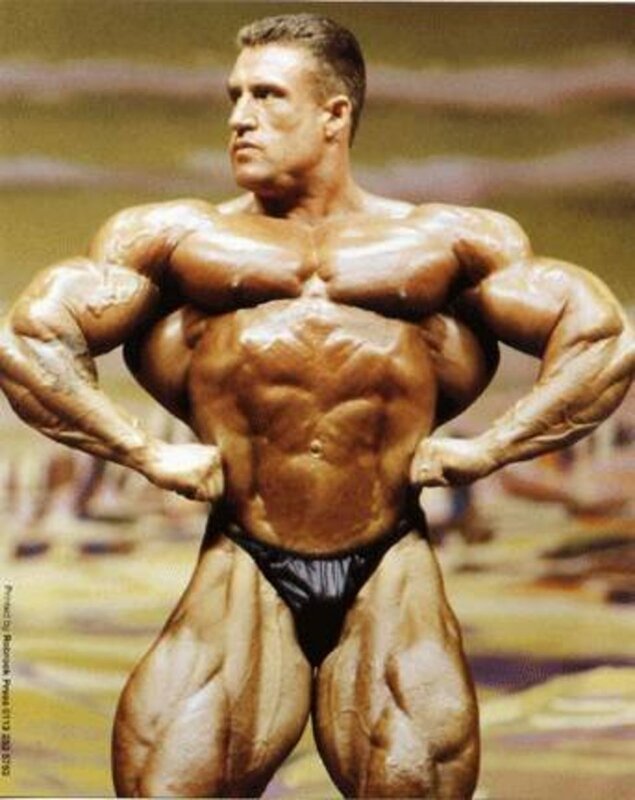 For the first few times, I recommend using a very light weight or no weight at all so you can focus on your form. Step-ups are a good exercise for your glutes. The glutes are the bum muscles. A step-up, as the name suggests, is stepping up like you do when you walk up a set of stairs. You can step forward, backward, or to one side and you can use a low step or a high step. The high steps are better for working out your glutes, but I still recommend using a low step some of the time. Hold onto a pair of dumbbells while doing the step ups. Stand up straight near the step with your feet shoulder width apart. Let your arms hang down at your side. Step onto the step and pull your body up so are standing with both feet on the step. Wait a second. Step off the step leading with your other foot and get back into the starting position. You should be pulling, not pushing. Do not tilt your back. It should be straight. You can use the bottom of a set of stairs, a chair, bench, or foot stool. For the high step-ups, I use a chair. The quads or quadriceps are the muscles at the front of your thighs. They are used when you extend your legs. 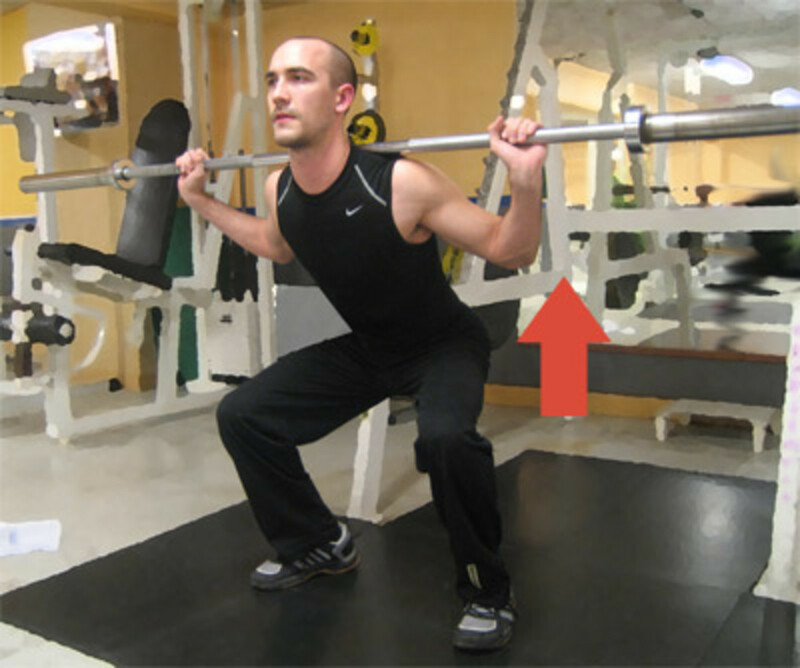 To do a squat, stand up straight with your feet and knees pointing forward. Slowly lower yourself down like you are going to sit down by bending your knees until your upper legs are parallel to the floor. Keep your back straight. After a second, stand up again. Do not lean forward or let your knees move forward. To do a lunge get into position by standing with your legs under you slightly less than shoulder width apart. Take a big step forward and drop your back knee near the floor without touching it. Push yourself back up using your front leg, making sure weight is on the heel. The exercise should be done slowly. Keep your back straight, don't lean forward and don't move your front knee as far as your toes. Squats are a sitting exercise and lunges are a stepping forward exercise. They go together like pull-ups and chin-ups. Good form is important, because doing it wrong can hurt your back or knees. 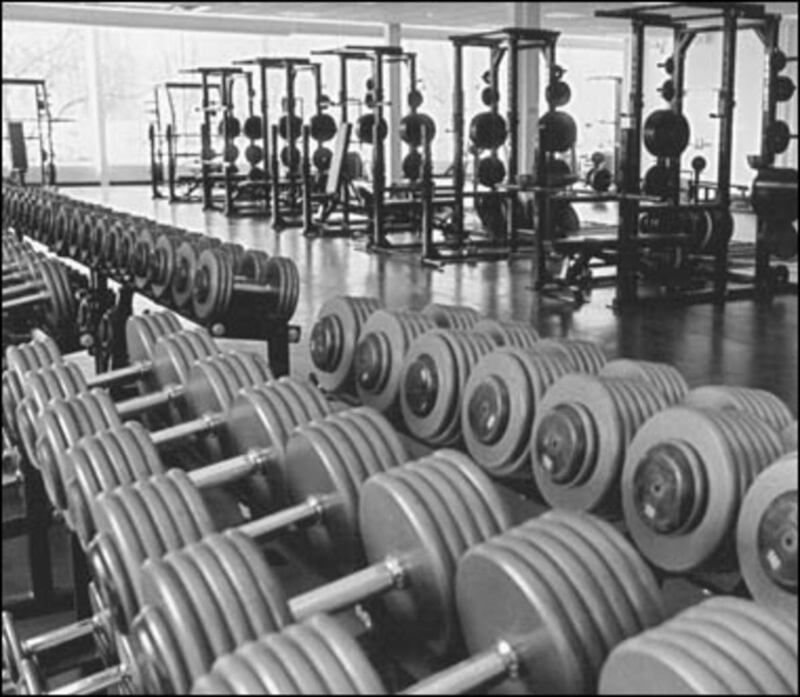 Practice without any weights first, then use dumbbells to increase the intensity. Hold onto the dumbbells, letting them hang at your sides. The hamstrings are the muscles and tendons at the back of your thigh. Tendons are like strings. They are used to extend your hips and bend the knees. Place a pair of dumbbells by your feet. Stand up straight with your hands at your sides and your knees slightly bent. Relax your body so you are more flexible. Bend down from your hips and grab the dumbbells to get into the starting position. Stand back up by slowly extending your hips. Bend over and touch the floor with the dumbbells. Pause for a second before doing another rep.
You lift and lower the dumbbells using your hips, not your arms. Your arms should be hanging at your side. Keep your back straight. You don't need to use really heavy weights for this exercise to give your hamstrings a good workout. Standing on your toes is actually a good exercise for your calf muscles. Grab a dumbbell or two and stand up straight with your feet shoulder width apart. Do the exercise by raising yourself up onto your toes and then lowering yourself down. For best results stand on the edge of something so your heels stay off the floor. Doing them at the bottom of a set of stairs works well. The first 10 reps may seem too easy but after that you should really start to feel it, at least that is how it was with me. 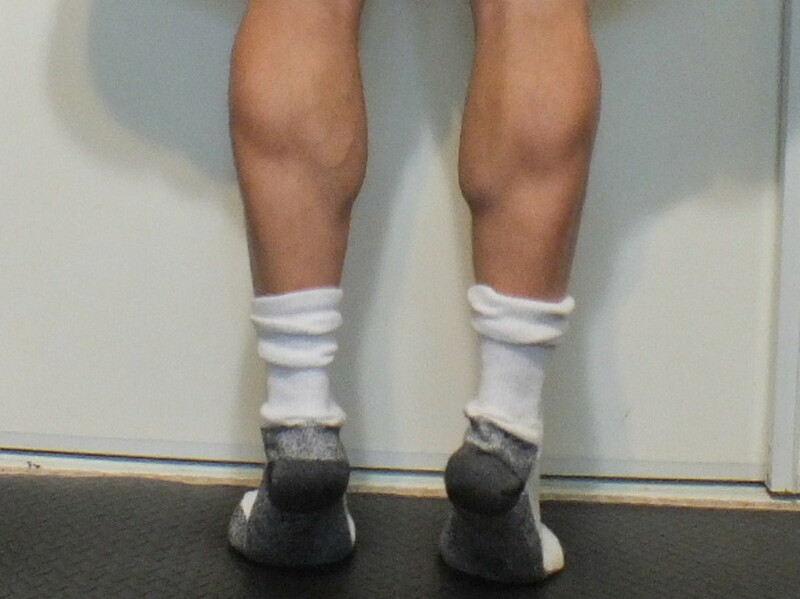 Calf-raises can also be done on one leg to increase the difficulty. Your body weight and a fairly light dumbbell would probably be enough. Avoid using really heavy dumbbells. I was doing sets of 12 with 10 pounds. Doing dumbbell swings can provide a good cardio workout, so they are good for your heart and lungs. Using an overhand grip, grab a dumbbell and squat down with your feet slightly wider than shoulder width apart. You squat by bending your knees like you are going to sit on a chair. Bend over and hold the dumbbell slightly in front of you between your legs. 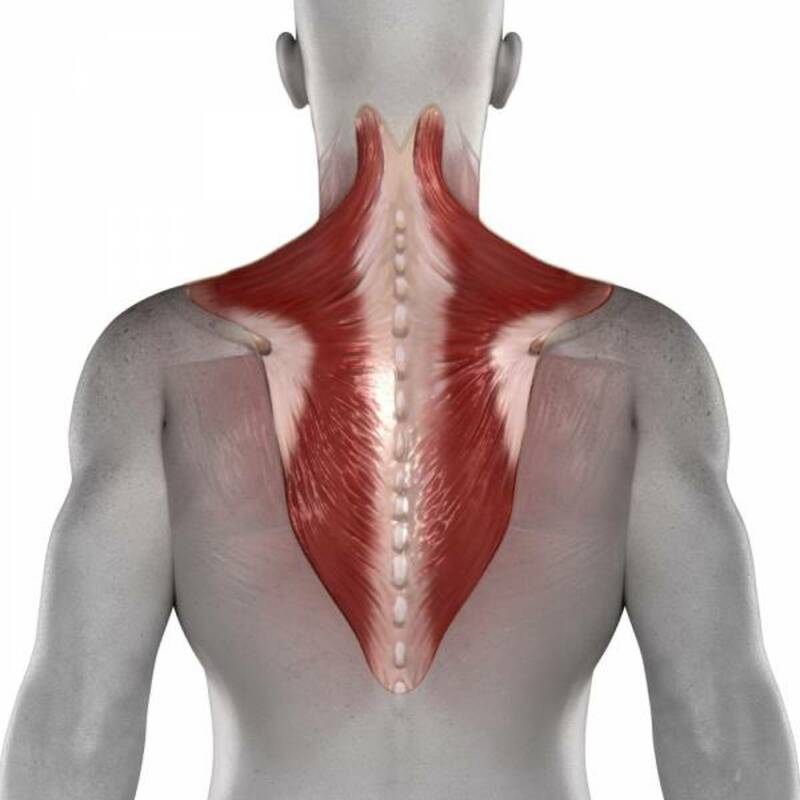 Your arm and back stay straight throughout the exercise. Swing the dumbbell upwards using your hips. When the dumbbell gets above your waist straighten your knees. Stop when the dumbbell is over the front of your head. Reverse the swing and squat down when the dumbbell gets below your waist to get back to the starting position. 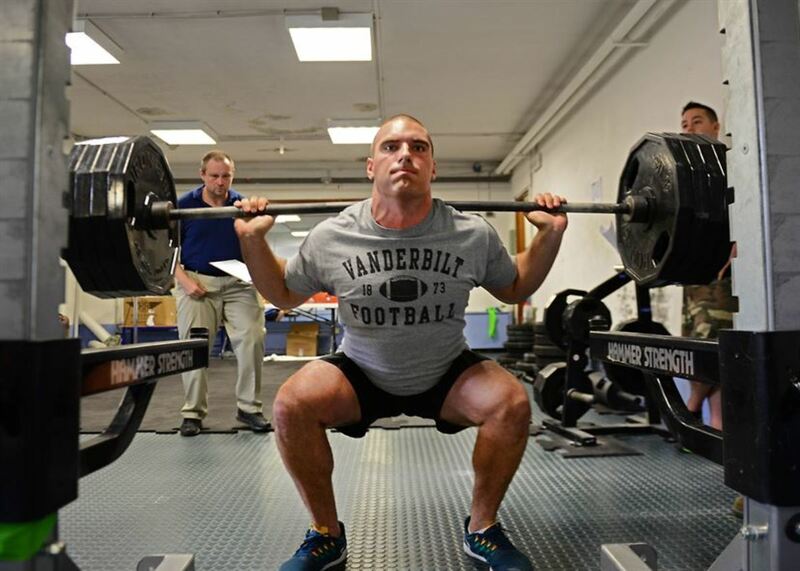 Unlike most weightlifting exercises you want to use momentum. Keep swinging up and down until you are done your set. The renegade rows with with push-ups exercise works the shoulders, biceps, triceps, forearms, back, chest, abs, and obliques. It also works the glutes, quadriceps, and hamstrings a little because your legs support some of the weight during the exercise. Exercises that work a lot of different muscles are good for burning a lot of calories, so they are good for getting rid of fat. To do dumbbell renegade rows, start by getting into the raised push up position while holding two dumbbells. Lift your elbow so it is near shoulder level bringing the dumbbell to the side of your body. Then lower your elbow. That is a row. Do it again with your other arm to complete one rep. Continue raising and lowering your elbow, alternating arms. It is a low-rep exercise. Five to eight reps per set is good. If you can do more try to increase the weight. Only your arm and shoulder should move. Remain as stiff as possible by engaging your abs and back muscles. Adding push ups to this exercise works more muscles and burns more calories. Do the push-ups between rows. One rep would be right row, push up, left row. Practice the push-ups and rows separately before combining them. You may also want to practice doing planks. To do a plank, you hold the raised push up position for 30 to 60 seconds keeping your body rigid. Planks are good for strengthening your abs and back. Just starting to get back into gym work after being away from it for a while. Some useful stuff here. Thanks.